Working in a media house, press releases make up quite a lot of what a journalist reads and works with. That explains why quite a number of us end up with poor grammar - it is so easy to pick up language usage from what we read. 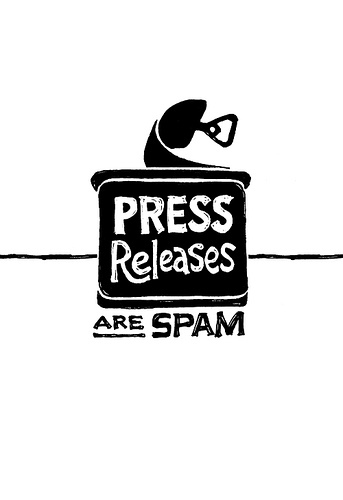 Press releases are meant to pass relevant information to the reader, sand should be targeted. The keyword here is relevant. Sadly, press releases are not meant your companies feel good, they can pee on themselves for that warm feeling. Releases thus are of no value if the targeted reader doesn’t get much value from them, which means that your client is failing in delivering value. Press releases also account for many the hardships journalists face. If you don’t believe me, below is a collection of characteristics exhibited in press releases send in from hell. The title is longer than this paragraph. Such press releases look as if someone converted the first paragraph into a title. I mean, there is nothing wrong with a 20 word title, right? Our company is the first of its kind, the best, the leading integrated provider and the only one to come up with this integrated innovation. Lots of flowery, difficult adjectives give you a clear understanding of what we do and our products. You love us so much, and you will love us more as we blow our own horns off this high pedestal. An image is worth 1,000 words. Including an image with our press release will make it quite lengthy, seeing that that’s an extra 1,000 words. In any case, the press love corresponding with us and will take time off their barely existent schedule to request for a photo. We may however, at times, fell sufficiently philanthropic to include a photo of our client. In such cases, the photo is to be made smaller than a passport photo, in such a way that it just gives a hint of what in the photo and when published in print, you can count the pixels, hence come up with about 12 pixels which we shall refer to as megapixels. Title. We couldn’t think up of an appropriate title of our press release, hence the title “press release.” Journalists are good at these things, and we are sure they will come up with a title. The Christmas Greetings Press Release: This press release intends to pass what would be exciting news, such as the stuff that makes press releases sound like they come from hell. Instead, it mentions that in passing and dwells on feel good messages from the CEO and President. Readers often get the overall feeling that they were wished a merry Christmas. Repetition. Mr. Dennis Kioko has today announced the start of an initiative dubbed PRESS RELEASES FROM HELL. Speaking at the launch of PRESS RELEASES FROM HELL , Mr. Dennis Kioko announced that PRESS RELEASES FROM HELL is targeted at firms including PR practitioners that take Grammar rules for granted. PRESS RELEASES FROM HELL is the first of its kind ….. The Forever Title: Press Releases are forever, readers love our firm so much that they will read the article regardless of a title that reads Press Release set to transform Africa. The Nightly Press Releases. Software developers will tell you of nightly software builds, which are test versions they release every day to test for what they coded. However, you never get nightly updates to your Firefox or Chrome browser. Similarly, unless you really have valuable information, nightly press releases tend to be more of noise, which will see you been ignored when you actually have something to say. Only talk if you have something to say, and don’t go desperately looking for something to say. Overall, one on one interviews with a firm are way better than press releases. However, such are also useless if “I cannot comment on that” is dominant phrase on the interview. An advert works way better in such situations. There are billion of pages on the Internet. People visit and spend their time on those with information.